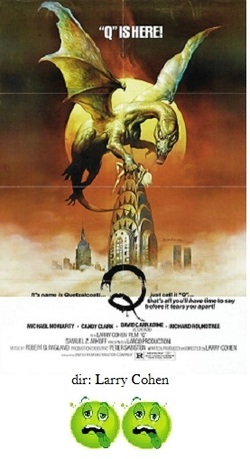 Q (also known as Q: The Winged Serpent) was somewhat of a underground cult hit. Writer-producer-director Larry Cohen, he of the It's Alive!, Piranha and The Stuff fame, actually garnered the first good reviews of his career with this creature feature. Looking at it today though, the flaws that were easy to ignore in 1982 are not so easy to set aside, today. Now, Q could almost stand for "quaint." Q takes place in New York City where a mysterious series of deaths and disappearances begin happening. Window washers have their heads ripped off, subathers are plucked off rooftops and folks down below periodically have blood and body parts dropped on them from the sky. At the same time this is going on, the police are investigating other bizarre deaths including people being found skinned in their hotel rooms. Is there a connection? The cops are played by David Carradine and Richard Rountree, so you know the acting doesn't exactly zing. In fact, if they were any flatter and emotionless, they'd be one of the corpses. Anyway, they make the connection (amazingly it seems, since there really aren't any clues to go by) that the dead bodies in the hotel rooms are actually sacrificial victims and that the killer is summoning up the ancient Aztec god, Quetzelcoatl. And you guessed it, Quetzelcoatl is the flying lizard that's munching on New York's roof dwellers. Next, enter Michael Moriarty (of "Law & Order" fame), a small time crook who is involved in a botched jewelry robbery. To escape the police he hides out at the Chrysler building. While evading security he goes to the very, very tippy top and low and behold, there is a nest and a giant egg and plenty of picked over skeletons. Moriarty's quirky performance is easily the most interesting thing about this movie. Every time he is on the screen the film almost hums with energy, but when he's not, it's a dead zone. The rest of the film includes more munching of city folk, the discovery of the lizard's existence and Moriarty who bribes the city for $1 million dollars in exchange for the knowledge of the creature's nesting place. The most obvious problem with Q is the budget. This movie is loooooow budget. It would have been in Larry Cohen's best interest to keep the creature off camera as much as possible, but no, we are treated to lots of shots of Quetzelcoatl and the effects are really crappy. Some of the worst stop-motion effects of the lizard which looks exactly like a plastic dinosaur toy filmed against the backdrop of the New York City skyline. The editing is atrocious and choppy; the film zips back and forth from the creature to the cops to bloody corpses to frantic pedestrians on the ground. Sometimes it feels out of sequence, almost edited at random. The performances from everyone involved, except for Moriarty, are just sad, almost like they were all embarassed to be in this movie, but looking at Carradine and Rountree's record, they should have looked at it as a step up. The only one truly slumming was Candy Clark who, after an Oscar nomination 9 years earlier ended up in dreck like this and Amityville 3-D. So, see Q if you must for a great, crazed performance by Michael Moriarty; other than that, there really isn't any reason at all to see it. Oddly enough, with some tweaking of the screenplay, and a talented cast and director with top-notch special effects, Q could be remade successfully today.